Your faithful MoMo Tokyo organizers are working on our event plans for the coming year, feedback on themes, speakers and potential locations is always welcome. We intend to announce upcoming MoMo dates with plenty of notice so members can juggle their busy schedules accordingly. Watch for updates coming soon – and mark MoMo on Feb. 18 in your calendar! 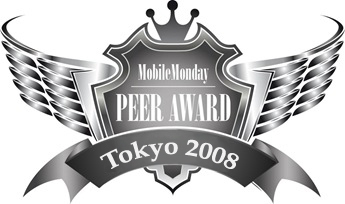 Heads-up to all innovative mobile start-up companies in Japan: While the 3rd annual MobileMonday Global Summit in Helsinki in September 2007 seems like only yesterday, we’re already looking forward to the 2008 event, in mid-May. The Global Peer Awards will play a central part in the Malaysia Global Summit, so we are calling for submissions from the local community to present here at the MoMo Tokyo 2008 Peer Awards in late March. There is no restriction on the business model, platform or market segment. Whether you have a content, service or application, targeted at B2B or B2C customers and/or running on Java, Brew, Symbian or Flash, you can submit (note, with respect to going global, presentations must be made in English). Representatives from qualified companies will take the stage to make a three-minute public pitch at the MoMo Tokyo Peer Awards; winners will proceed to the Asia regional show-down with the best-of-the-best headed to the Global Peer Award Finals in Kuala Lumpur on May 18. Interested parties should contact us directly – ASAP – with their company profile. Ganbatte! Finally, as we are well into our fourth year of running MoMo Tokyo events, we’re pulling together a new sponsorship kit with some compelling data. Leading companies are encouraged to reach out and explore how we can work together on this growing and lively project in 2008. 22:30 – Close – Nijikai..